Democrats, Women Candidates Score big in Texas Primaries - Integration Through Media ....! (VOA): Women running for Congress surged to big wins and Democrats smashed recent turnout levels in Texas' first-in-the-nation 2018 primary elections, giving Republicans a potential glimpse of what's ahead in the first midterms under President Donald Trump. Energized and angry Democrats in Texas, where the GOP has dominated for decades, came out in force to surpass 1 million voters Tuesday – the first time the party has eclipsed that benchmark in a midterm primary since 2002, just months after the Sept. 11 attacks. Equally striking was the showing by women on the ballot: Of the nearly 50 women running for Congress in Texas, more than half won their primaries outright or advanced to runoffs. What's more, at least three of those runoffs in May will feature women going head-to-head, including a key race for Democrats in their bid to take control of the U.S. House this fall. "It's Trump. It's Trump," said Veronica Escobar, who won her Democratic primary and is now poised to become one of the first Hispanic women to represent Texas in Congress. "I've spoken to innumerable senior citizens, retirees, parents of disabled children, people who understand what this administration means to their families. And they're afraid." Not all women fared so well. Kathaleen Wall, a Republican megadonor in Houston who pumped $6 million of her own money into her race for Congress, failed to survive a crowded nine-person field despite outspending all other candidates and having the backing of Republican Gov. Greg Abbott. Wall's failure was also a potential warning sign of the limits of Republicans going all-in on Trump this election year. She partly staked her candidacy on TV ads that told voters there was little daylight between her and the president, who remains popular among GOP voters despite his rough edges and low approval ratings nationwide. For all the talk of renewed Democratic energy heading into the 2018 midterms, Texas Republicans also set a new benchmark for turnout in a midterm election. More than 1.5 million people voted Tuesday in the Republican primary for U.S. Senate, won by incumbent Ted Cruz. That beats the previous record of 1.48 million in 2010, during former President Barack Obama's first term. 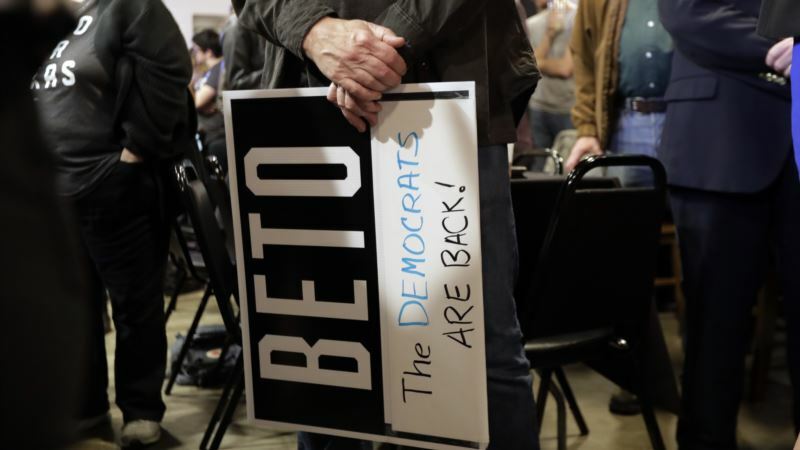 Democrats showed up despite the long odds this November of ousting Republicans such as Cruz – who released a radio ad after clinching the GOP nomination Tuesday night, telling voters that Democratic opponent Beto O'Rourke "wants to take our guns." O'Rourke, a congressman from El Paso, has called for banning AR-15-style assault rifles in wake of last month's mass shooting at a Florida high school that killed 17 people. Neither that tragedy nor a mass shooting at a Texas church last fall played as dominant campaign issues in Texas, but with the GOP's majority in Congress on the line this fall, Democrats showed up. Democrats have their sights on flipping three GOP-controlled congressional seats in Texas that backed Hillary Clinton over Trump in 2016, including a Houston district where liberal favorite Laura Moser forced a runoff with Lizzie Pannill Fletcher. Another is a sprawling district that runs along the Texas-Mexico border, where Gina Ortiz-Jones advanced to a May runoff and another woman, Judy Canales, was battling to join her. "I think that a Congress that is only 20 percent women is not where we need to be," Ortiz Jones said. "This is not a spectator sport. We've got to participate, all of us and that's what's important." College students waited more than an hour to vote in liberal Austin and rural counties offered Democratic candidates for the first time in years. Many women ran in a record eight open congressional races this year in Texas – two of which are up for grabs after longtime GOP incumbents abandoned plans for re-election amid scandal. While 2002 was a high water mark for Democratic turnout in Texas it also showed the limits of the exuberance for turning the state blue. In November that year, the Democrats running for statewide office were all beaten, just as they have been since 1994. For Republicans, the primary was a vivid exhibition of the Trump effect in GOP politics. George P. Bush, the Texas land commissioner, won a contested primary after he cozied-up to a president who once called his dad, Jeb, a pathetic person. Trump won Texas by 9 points in 2016. It was the smallest margin of victory by a Republican presidential candidate in Texas in 20 years, but Cruz dismissed talk of a Democratic takeover this fall. "Left-wing rage may raise a bunch of money from people online, but I don't believe it reflects the views of a majority of Texans," he told reporters after winning the nomination. Democrats will have a tough time winning statewide races in November despite the "Trump effect" because they have fielded little-known candidates against top Republicans, such as Republican Gov. Abbott and Lt. Gov. Dan Patrick. Even Attorney General Ken Paxton, who has been indicted on felony securities fraud charges, clinched his party's nomination unopposed. Abbott will face either Lupe Valdez, who was Texas' first Hispanic, lesbian sheriff, or Andrew White, who opposes abortion and whose father, Mark, was governor in the 1980s.